The scene of the shooting in central Dublin in May 2006. A PROSECUTION BARRISTER has told the Special Criminal Court that the murder of Gareth Hutch was “brutal and callous” and a significant amount of planning had gone into it. 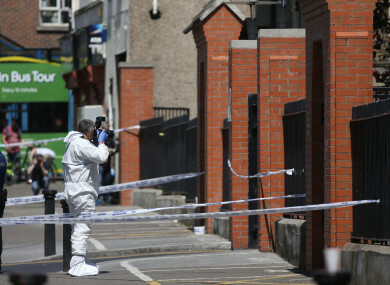 Hutch (36), nephew of Gerry “the Monk” Hutch, was shot dead as he was getting into his car outside Avondale House flats on North Cumberland Street in Dublin on the morning of 24 May 2016. A brother and sister as well as another man have this morning gone on trial at the non-jury, three-judge Special Criminal Court accused of murdering Hutch. Thomas Fox (31) with an address at Rutland Court, Dublin 1, Regina Keogh (41) from Avondale House, Cumberland Street North, Dublin 1 and Jonathan Keogh (32) of Gloucester Place, Dublin 1, are all charged with the alleged murder of Hutch. The three accused pleaded not guilty, when arraigned before the Special Criminal Court this morning. Fox also denied unlawfully possessing a Makarov 9mm handgun on 23 May 2016 at the same place. Opening the prosecution case today, Paul Burns SC said the killing of Hutch was a “brutal and callous murder” which was not a spontaneous or spur of the moment act. “It was premeditated and a significant amount of planning had gone into it,” he said. It involved a number of participants and each had their own part to play in bringing about of the death of Hutch, he said. “All three accused were knowingly involved in the preparation,” the court heard. Burns said for one to be guilty of murder, one does not have to be the person who actually pulled the trigger and the doctrine of joint enterprise is where participants of crime can all be held jointly responsible. “Any person who aids, abets, counsels or procures shall be indicted and punished as a principal offender,” he added. The barrister said Keogh was one of two gunmen who carried out the attack. The court heard that Keogh and Fox were well known to each other. He also told the court that Regina Keogh lived on a ground floor flat in Avondale House while Hutch lived in a first floor flat in the same block. “There is a fourth party believed to be directly involved in the killing and who is currently at large,” he said. Burns said that on 23 May, the day before the shooting, a black BMW motor vehicle was parked in the carpark of Avondale House. Later that day, a Honda Civic vehicle arrived into the carpark which Keogh and Fox were in. Having driven into the complex, Keogh confronted and chased a man who had been waiting in the car park and Burns said the court will hear more about those details later in the trial. Burns said the evidence will be that the man was apparently waiting to meet Hutch and/or Ross Hutch in respect of the sale of a motor vehicle. A heated exchange took place between Keogh and Gareth Hutch in the car park but it appeared to end with the parties shaking hands, said counsel. The court will hear evidence, he said, that later that day a number of persons including Keogh, Fox and Regina Keogh were in Mary McDonnell’s flat which was a first-floor apartment on the same level as Hutch’s apartment and in the same block as Regina Keogh’s flat. Burns said it is important to note that from McDonnell’s kitchen, one can view Hutch’s flat and see people coming and going from it. Evidence will also be heard that when Keogh was in McDonnell’s flat, he had a phone conversation with another member of the extended Hutch family. When in the apartment, Keogh also expressed an intention to kill Hutch, said Burns. Counsel said the court will hear that before 10am the next day, another man indicated to Keogh that Hutch had left his flat. As Hutch made his way to the car park, Keogh and the other man left McDonnell’s flat and made their way to the carpark. Burns said the evidence will be that as Hutch was getting into his Volkswagen Passat, the two men ran towards him. Each man was carrying a handgun and Hutch was shot four times, with two shots in the neck, one in his lower back and one in his upper chest. He was pronounced dead at 10.36am that morning. Burns said the court will hear that all bullets came from a single weapon and the firearms were discarded by the men in the car park. Both men ran to the black BMW which had been strategically parked in the car park the previous day, he said. There was a possible difficulty getting the car to move and it was abandoned as the two men ran from the complex. The evidence will be that Keogh and the other man ran from Avondale House towards Sean McDermott Street where a silver Skoda was parked at Champions Avenue. “This vehicle can be connected to Keogh and the other man, who travelled via Buckingham Street,” he said. The court will hear that Keogh then got out of the car and fled on foot. The vehicle was later found burnt out in Dublin 11. “There appeared to be a change of plan, instead of using the BMW, the Skoda vehicle had been used,” said Burns. CCTV footage in Avondale House, the court heard, captured many of the events including the altercation on 23 May and the actual shooting of Hutch. The evidence will be that Fox, Keogh and the other man can be connected to the vehicles, said counsel. Gardaí recovered jerry cans of petrol in both the BMW and a Ford Transit which the prosecution say were intended to burn the cars. It appears a paint spray had been used to blacken out the windows of the BMW, he added. Burns said forensic evidence will connect Fox to the aerosol and jerry can. Forensics will also connect Keogh to clothing in the BMW vehicle and to latex gloves. It is also the prosecution’s case that forensic evidence will connect all three men to a newspaper found in the Toyota Avensis. Also, recovered from the Ford Transit was a bottle of Milton sterilising fluid which the prosecution say they can connect Fox and Keogh to. The barrister further stated that phones identified by gardai can be shown to have pinged off phone masts at relevant times and in relevant locations. Burns said the court will hear that Keogh went to Belfast following the shooting and Regina Keogh arranged for money to be brought to him there. He was later extradited from the UK. “In essence Keogh was one of the gunmen who directed the attack which killed Hutch,” said counsel. The barrister said Keogh and Fox were “instrumental” in the planning and carrying out of the attack. Burns said that the testimony by McDonnell will be “important evidence”, in addition to other eye witness evidence. The court heard she provided an initial statement to Gardaí and then gardaí obtained a search warrant to search her flat. Burns said it was in the course of this search that she began to talk to gardaí by way of a voluntary conversation. She was later arrested on suspicion of murdering Hutch and was ultimately charged with withholding information but that charge was subsequently withdrawn and on 8 May this year she was provided with a letter of immunity. “I submit that when the court hears all evidence in the trial, it will be satisfied as to the guilt of all the accused,” said Burns. The trial resumes tomorrow before Justice Tony Hunt, presiding, sitting with Judge Patricia Ryan and Judge Michael Walsh. It is expected to last more than four weeks. Email “Brother, sister and third man go on trial for 'brutal and callous' murder of Gareth Hutch”. Feedback on “Brother, sister and third man go on trial for 'brutal and callous' murder of Gareth Hutch”.